The sci-fi genre tends to put my cynical filmic sensibilities on high alert. More often than not, the genre offers cinema an easy vehicle for over-bloated visual bombast. But every so often a film comes along that is carefully considered and more concerned about its characters than the audience’s wallet — Alex Garland’s Ex Machina and Jonathan Glazer’s Under the Skin are excellent recent examples of this. Given its pedigree, I was very hopeful that Midnight Special would join this good company. Written and directed by Jeff Nichols (Mud, Take Shelter), Midnight Special has just run its course on the screens of this year’s New Zealand International Film Festival. Fear not if you missed it there, as it has just been released on DVD and some streaming providers. 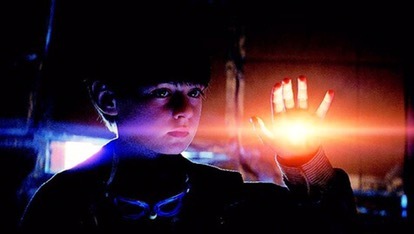 Set in the present, the plot centres around Alton (Jaeden Lieberher) who is a 9-year-old boy with special powers. His father Roy (Michael Shannon) helps him flee a doomsday cult in order to get him to an undisclosed “destination” (a place that ostensibly operates as the film’s MacGuffin). Lucas (Joel Edgerton) is a family friend who helps the pair flee and reunite with the boy’s mother (Kirsten Dunst). Meanwhile, Sevier (Adam Driver) is an NSA agent trying to investigate the nature of Alton’s powers. For the most part, Midnight Special is a solid piece of entertainment. It is very well acted and Nichols successfully squeezes fantastic performances out of Shannon and Dunst, employing a relatively slim script and a very vivid form of visual storytelling. The economy of dialogue complements the brooding soundtrack that builds tension and a foreboding sense of dread as the film progresses. However, the film is not without its frustrations. Nichols, intentionally or not, has made a film that mixes its genres; Midnight Special is part sci-fi, part family drama, and also has elements of a superhero origins story. The juggling of genres confuses the film’s identity rather than forming it, and the result is an uneasy mix of unfinished narrative threads and a blow-out of characters that are crying out to be explored in far greater depth. This unfortunately obstructed what may have been a very personal experience had more attention been given to a smaller number of players. Very good in parts, but ultimately Midnight Special feels more like a missed opportunity than a cinematic triumph. Read the published review here.